It wasn’t until my third year at Wudang that I started to find the training interesting, and started to train harder because I was genuinely interested in it. It wasn’t until my third year at Wudang that I started to find the training interesting, and started to train harder because I was genuinely interested in it. I liked the changes that were happening to me, not just physically, but mentally as well. I started to help teach the younger students. With a handful of advanced students, I trained in all of the traditional Wudang marital forms: first Xuan Gong Quan, Xuan Wu Quan, Xuan Zhen Quan, Taiji, Xingyi and You Long Bagua. The Wudang styles are ‘internal’ martial arts, meaning that they focus on flexibility, whole body movement, and increased Qi flow in the body. In the internal arts, the practitioner does not rely on the use of brute strength to defeat the opponent, but instead uses muscular strength supported by Qi. The Wudang martial arts practice exerting force only when already in contact with the opponent, by transforming and redirecting the attack. You can see this philosophy in what Lao Zi wrote in the Dao De Jing saying, "The soft and the pliable will defeat the hard and strong." By learning exactly when to apply force, and in which direction, we learn to redirect an opponent’s own weight and momentum, using it against them, attacking when the opponent is off balance. For example, when I am fighting someone stronger than I am, if I push them, my pressure may not knock them over. However, were I to pull the person forward slightly, they then would naturally react by throwing their weight backwards, at which time we stick, follow, and attack. You may also just wait until the other person is moving backwards. Were I then to apply the same pressure, with the two forces combined, it is more likely that the person will fall over. With the Wudang arts, you can most effectively use the physical strength you have, while developing these subtle skills of listening and following jing, and defeat an opponent without having to overpower them. The movements of the internal arts are often compared to clouds and water. Clouds move seamlessly. Water absorbs any force that comes at it, and flows around obstacles. Water is one of the most common metaphors in Daoist literature. Observing nature and learning from it is common ground for Daoism and the Martial Arts. Because every aspect of life is a manifestation of the Dao, even a cloud or the movements of an animal can teach us something. During my years of training, my interest in Daoism was also growing. My teachers at the martial arts school never talked about Daoism. However, we would often come into contact with the monks who shared the mountain with us. For me, Daoism is a way of living in harmony with nature. It is a way of putting each of my actions into perspective and seeing which of my actions run contrary to nature and are thus unhealthy. As the martial arts helped me attain physical health, learning about Daoism brought about mental and spiritual well-being. In 1997, I decided to become a Daoist monk. In all my years at the martial arts school, I was the only student who chose the Daoist path. Even then, Daoist monks were few and far between. When I took my ordination as a monk, I moved to Jin Ding temple, which is at the very top of Wudang Mountain. I learned how to recite scripture, learned various practices, and studied the I Ching. At night after the tour groups left, I practiced my martial arts. It is an ancient Daoist tradition to travel from temple to temple in order to learn new things. So, in late 1999, I left Wudang Mountain. Because Daoism teaches that spiritual health is linked to physical health, many martial artists can be found in Daoist temples. Whenever I came across a fellow martial artist in my travels, I would take the time to learn what I could from them before moving on. I traveled through Henan Province to Tanghe where I worked teaching at a martial arts academy that one of my fellow students had started. I spent some time at Hua Shan, a famous Daoist mountain outside Xi’an. I also spent some time in the temples of Shandong Province, at Tai Shan and Lao Shan. While at Lao Shan I met and two Daoists who had also studied Bagua and Xingyi. The three of us became good friends, practicing and exchanging ideas together. I was excited to meet and dialogue with other serious martial artists. I hope that more people will be willing to learn from each other, and from other schools, as the Chinese arts gain popularity. 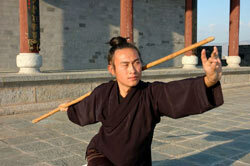 It is only among retired people that the martial arts are flourishing in China. Every morning the parks are filled with older people practicing taiji and qigong. Perhaps it is due to this imbalance in the age of practitioners that the taiji being taught in the west looks less martial and more like the health-preserving art practiced by our older generation. Being an internal art, taiji is a great health practice. But, I am afraid that taiji is losing touch with its roots as a fighting art. Even for people not interested in learning how to fight, learning the martial applications for every move would help them remember the form, and to practice each move correctly. I think that for many people in America, broadening their taiji practice to include more of the martial side would make their practice more rewarding. I intend to preserve and promote the martial aspects of the Wudang arts. For centuries, the secrets of Wudang Mountain were available only to very few people. But what was started at Wudang is now spreading all over the world. I am fortunate to be a part of this process. I’d love the opportunity to teach more in the West, or bring groups of people to visit China to study. We have a famous phrase in China saying that "You only realize how valuable your treasure is when you see someone else holding it". Hopefully this saying will prove true, and America’s enthusiasm for the martial arts can lead to a rejuvenation of the traditional arts in China, and across the world.